Enhancements are pre-built batch edits written by Mitinet™ to help you update and maintain your entire database. These edits are continually updated so your records always have the latest information when you update. You can run individual Enhancements directly from the Tools pane or run multiple enhancements by putting them into a Workflow. If you have BestMARC Global, you can also add custom Global Edits to any workflow containing enhancements. Options for each enhancement are stored in your Profile. Click on the Profile link at the top of the page or select the My Records > Options > Profile Settings menu item. When you Run an enhancement, the options set on the Enhancements tab in your profile determine what changes will be made. Not all enhancements have options. Running an Enhancement makes changes to records already loaded into into your My Records grid. 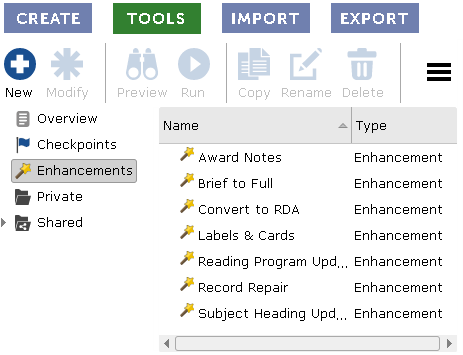 Open the Enhancements folder, and click on the Enhancement you wish to run. Click on the Run button or right-click on the enhancement and select Run from the menu. All records - Update all records in the My Records grid. The records are now removed from the My Records grid. The Status of the job periodically updates on this tab. You can continue working in BestMARC™ or close it as your job continues processing. After processing, the records are loaded back into the My Records grid and a report appears in the same tab. Close the tab by clicking the X in the tab's header. 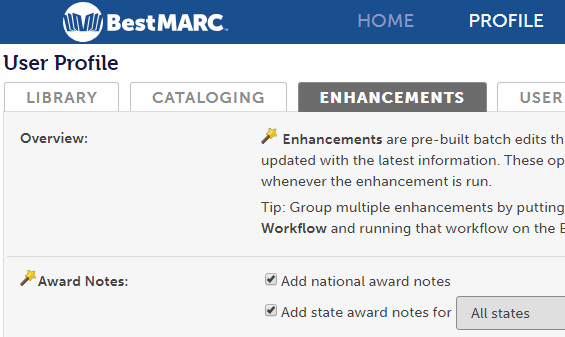 The Award Notes enhancement adds state and/or national award notes to your MARC records. As awards become available, they are automatically added to this enhancement. 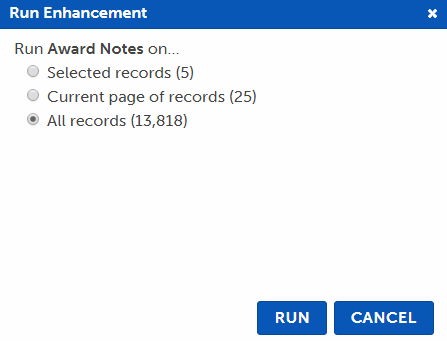 Add national award notes - check to add national awards to your records. Add state award notes - check to add state awards to your records. You can choose to add for All states or just the states you select. 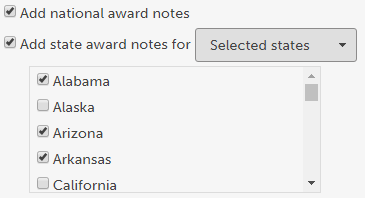 To select individual states, choose Selected states and then add a checkbox next to each state's awards you wish to add. The Convert to RDA enhancement converts records to the RDA format. This enhancement is licensed separately and will not appear in your enhancements list if your organization is not licensed for it. Nearly 100 terms expanded to the new RDA standard terminology - For example, "p." to "pages" or "ill." to "illustrations"
Corporate name abbreviations expanded - For example, "Corp." to "Corporation"
Month and year terminology expanded - For example "Jan." to "January" or "cent." to "century"
Birth and death date formatting converted - For example "1979." becomes "1979-" or "b. 1979 d. 2014" becomes "1979-2014"
The Reading Program Updates enhancement adds reading program information into to your MARC records. As new reading program data becomes available directly from the reading program's administrator, it is automatically added to this service. Accelerated Reader - check to update your records with the latest Renaissance Learning's Accelerated Reader data. Fountas & Pinnell - check to update your records with the latest Fountas & Pinnell data. Lexile - check to update your records with the latest MetaMetrics Lexile data. Add Mitinet Measures when a Lexile is not found - Mitinet Measures is a correlated approximation of a Lexile score that can be added to some materials whenever a registered Lexile score is not found. 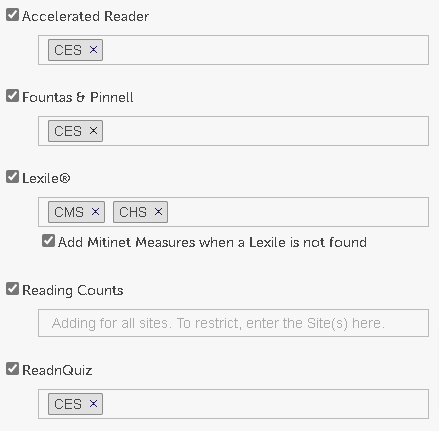 If a registered Lexile score is later found, the Mitinet Measure will be replaced with it. Check to update your records with the latest Mitinet Measure data. Reading Counts - check to update your records with the latest Houghton Mifflin Harcourt Reading Counts! data. Only add to Locations - The name of this option changes based on the Library Automation System you've picked. Some other terms for "Location" are "Location Short Code", "Site", or "Library". For each reading program, you can specify which locations you wish to add that reading program data. Enter the location code for each location you wish to add, separating multiple locations with a comma. Leave blank to add for all locations. BestMARC uses the holdings in your records and the location codes you've entered here to determine whether to add reading program data and whether to create a label in the output site's label PDFs. If there are no holdings, the data is always added. To generate a PDF of labels that you can print off whenever a reading program's data is added or changed, set the Reading Program Labels section of the Labels & Cards enhancement. The Record Repair enhancement automatically fixes common problems in your MARC records. Set Place of Publication control field from 260/264 $a - Looks for publisher information in the 260 (for AACR2) or 264 (for RDA) field. The MARC's Place of Publication control field will be set for known publishers. Set Date of Publication control field from 260/264 $c - Looks for publication date information in the 260 (for AACR2) or 264 (for RDA) field. The MARC's Date of Publication control field will be set when known. 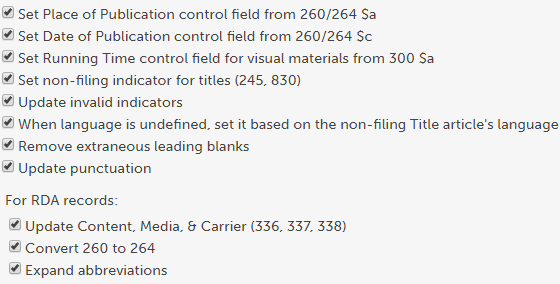 Set Running Time control field for visual materials from 300 $a - Looks for running time information in the 300 $a subfield for visual material records (i.e. videorecordings). The MARC's Running Time control field will be set when known. Update invalid indicators - If a field has an indicator value that is invalid, it is set to a valid value based on the field and its contents. When language is undefined, set it based on the non-filing Title article's language - If the record's language is set to undefined and the record's Title has a leading article, the language is set based on the language of that article. If there is no leading article or the language cannot be determined, no changes are made. Remove extraneous leading blanks - If a field has blank spaces at the beginning of the field, they are removed. This option does not change fields where leading blanks are allowed, such as the 010. Update punctuation - Update the record's punctuation at the end of subfields. Each field has different rules based on the subfields that have content. Update Content, Media, & Carrier (336, 337, 338) - The 336, 337, and 338 fields are created if they are missing based on the record's material type. Convert 260 to 264 - If an AACR2 publisher field is found, it is converted to the appropriate RDA publisher in the 264. Expand abbreviations - If an AACR2 abbreviation is found, expand it to the full RDA term. The Subject Heading Updates enhancement updates the subject heading information in your MARC records. As new subject heading data becomes available directly from the authority (i.e. Library of Congress or Sears), it is automatically added to this service. Update subject types - check the subject types you would like to update in your records. The latest authority data is used to update old subjects to new ones with the latest terminology. In some cases new subjects can be added based on your current subjects. Add kid-friendly subjects - check to add kid-friendly subject headings to your records. Based on your current subjects, kid-friendly subject headings can be added to aid patrons in searching for materials. For example, when "Arachnids" is found, subjects for "Spiders" and "Bugs" will be added. Update politically sensitive subjects - check to update subjects containing old, politicially sensitive subjects to the latest terminology. For example, "Indians" is replaced with "Native Americans". Redundant subjects - select an option for how you wish to handle redundant subject headings in your records. Redundant subjects are subjects that have the same term but are coded from different subject sources. For example, an identical subject coming from both Library of Congress and Sears. Only redundant subjects are removed. Subjects of all types are retained if they are unique. Keep redundant subjects - Do not do any additional processing of redundant subjects. Keep Library of Congress - Keep the Library of Congress subject and remove redundant subjects of other types. Keep Library of Congress Children's - Keep the Library of Congress Children's subject and remove redundant subjects of other types. Keep Sears - Keep the Sears subject and remove redundant subjects of other types. "Juvenile" options - Some librarians and students do not like the term "Juvenile" in their library systems. Select a "Juvenile fiction" and "Juvenile literature" option from the list. If the term is found in a 600-689 field, it can be removed. Juvenile fiction can be replaced with Fiction. Put subjects in numerical order - Standard cataloging practice is to put the most important subject headings first, however some librarians like to have their subjects in numerical order by tag. Check this option to sort subjects numerically. The Labels & Cards enhancement creates PDF file(s) containing various label and card types and puts them into your Downloads tab. You can then download and print these files with a laser printer onto 8½" x 11" label or card sheets. There is a special option to run this enhancement upon Export, or you can Run it on the edit pane like all other Enhancements. Due to its special nature, you cannot add the Labels & Cards enhancement to a Workflow. When printing, make sure to print actual size and that any scaling options (such as "Fit to page") are turned off. Often these options are on by default and this will cause alignment issues when printing. Spine labels - Choose whether you want to stack the dewey on separate lines, and check any additional information you want to put on the labels. The profile's example shows a rough estimate of how the labels will look based on the selected options. Vertical call number labels - The call number printed vertically on the label. Reading program labels - Check each reading program you wish to generate labels for. A file for each site will be generated. 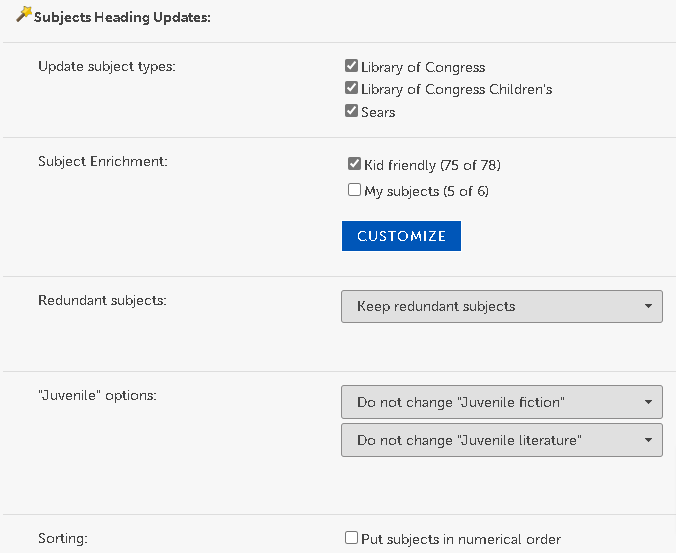 This option also causes change labels to be generated automatically whenever the Reading Program Updates enhancement is run. Include identification labels (recommended) - If this option is selected, an additional label is printed next to the actual labels with Title, Author, Dewey, Copyright, and ISBN to help identify which item the labels go on. This uses more label stock but makes it easier to determine what labels go on what items. Catalog Card Set - Includes main entry card, title entry card, subject and added entry cards (one for each traced entry), and two shelf list cards for each record. Shelf List Cards - Includes only a shelf list card for each record. Title Cards - Includes only a title entry card for each record. Use Rule of 3 for Subjects and Main/Added Entries - When checked, a maximum of 3 Subjects and Main/Added Entries are printed on cards. Use AARC2 formatting for RDA records - When checked, RDA records are formatted in AACR2 for condensed printing onto cards. For instance, this prints common AACR2 abbreviations onto cards when the RDA record contains the spelled out text.